Big Bow posture stretches the entire back: the bottom of the foot, calf, thigh, lower back, and upper back. This exercise activates the Bladder Meridian, which spreads all over in the back of the body. MBX-7: Big Bow Posture stimulates Bladder Meridian. From natural stance, inhaling, stretch your arms as high as you can with one hand overlapping the other and the palms facing upward. Exhaling, slowly lower your stance. 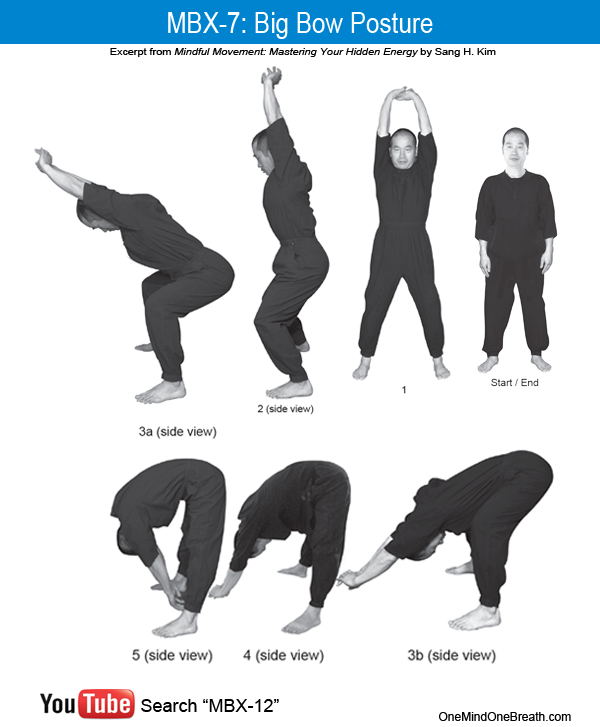 Inhaling, slowly bend your body forward and reach your hands out to the front until your hands reach the floor (3a-3b). Exhaling, lift your hip slightly and stretch your arms further forward (or place your hands on the floor). Feel the release in the lower back. Inhaling, very slowly arch your back and bring your body up to natural stance. The bladder meridian begins as two channels originating from the inner corner of the eyes, rises to the top of the skull, descends to the neck, and splits into four channels in the back, merging into two channels again in the rear thigh, then merging again into one channel in the upper calf, and ending at the lateral side of the tip of the little toe. The Bladder Meridian is stretched, soothed, and stimulated by MBX 7: Big Bow Posture. 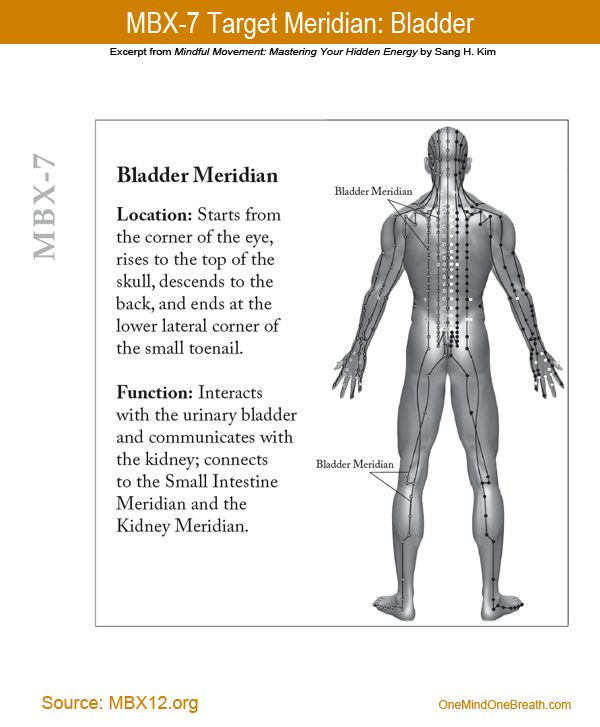 The Bladder Meridian connects the kidney and urinary bladder and the brain, monitoring and regulating water metabolism in the body. Big Bow posture stimulates these organs and induces positive effects such as improved circulation and relaxation as well as reduced blood pressure and anxiety. Focus Practice is the key to improving your awareness skills. During Tilting Stretching focus your attention on the specific part of the body, starting from the feet, legs, hips, torso, head, arms, and hands. You should practice this posture very slowly to prevent dizziness and loss of balance. The key movement is Tilting Stretch (3b) in which you stretch your arms forward and the buttocks backward as far as you can while exhaling. (You may place your hands on the floor for better anchoring.) Then lift your hip slightly to release the tension in the pelvic floor and the lower back while keeping your hands close to the floor (4). This entry was posted in MBX Project, MBX-12 Workshop, MBX12, Mindful Movement and tagged Big Bow Posture, Bladder Meridian, Centering, Equilibrium, How to. Bookmark the permalink.